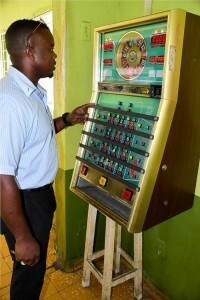 WILLEMSTAD - The Inspection Team of Economic Affairs has seized two slot machines at Buena Vista. There was no permit for this and they will never get one issued either because there is a school nearby. That is against the law. At one of the bars, near post 5 Isla (oil refinery), the slot machine was so dirty that the place had to be closed. After cleaning, it may be opened again.